Today's post is a bit different here at Cross-Country Corvette since no Corvettes were involved. Rather, it was my opportunity to take up my friend Brian's invitation to go for an outing in his beautiful Superformance Cobra, a replica of a 1965 Shelby 427 Cobra, one of the great iconic cars. As a young person, I collected whatever I could about Carroll Shelby, the LeMans 24 Hours-winning former Texas chicken farmer, who, at the end of his racing career due to heart issues, went into the car manufacturing business by taking the beautiful lightweight AC Ace sports car from England and stuffing in a lusty Ford V8 to create cars to stop other people's hearts. The ultimate version, with flared fenders and a monster engine, was the 427. Between 1961 and 1968 only a total of 998 cars were built as Shelby switched his attention more to Mustang modification. Of these, only 343 were the big-engined cars. Originally sold for around US$7,500, an original 427 has a market value today of between US$1.3 and 1.7 million. But more than one enterprising person realized that the Cobra was a very simple car, with a tubular steel frame easily welded, a crazily powerful but easily obtainable engine, and no complicated creature comforts, like roll-up windows. Or power steering. Or power brakes. Bodies were easy to replicate in fiberglass rather than the original aluminum. To Mr. Shelby's consternation, a cottage industry of Cobra kit car manufacturers sprang up, and people were able to actually go out and drive a car that gave back a very comparable impression to those original cars. As a younger man, I had dreamed of building my own Cobra and driving across the United States. Cobra manufacturers have since come and gone but one of the most successful is Superformance, which maintains a factory in South Africa, and ship cars minus drivetrains to the United States for completion by the customer (or his mechanic, more likely). It is the only replica maker licensed by Shelby. Brian's car, with its pumped-up Ford 392 Stroker V8, worked up from a 351W, is beautifully constructed, with gleaming blue paint and white racing stripes. Upon arrival at his house, I was issued with a set of foam earplugs, and provided with some useful instruction. The Cobra is very, very loud and the sidepipe exhausts amplify the sound right next to you. They also get very hot so the instruction was about the best way to get in and out of the car without leaving charred skin on the pipes. This involved opening the tiny door and then stepping high over the side and standing in the car before sitting down. It was a bit trickier getting out but I suspect if you burn your leg once you will never forget again how to do it properly. The Cobra weighs around 1,000 pounds less than my Corvette with roughly the same horsepower but also has a mere 90 inch wheelbase. The interior is quite spartan (Radio? Whatever for?) but the seats, which really are described as buckets, are very comfortable. Leg room is good, although your feet are splayed off to the side due to the large transmission tunnel. The windshield offers some protection from the wind but at higher speeds your baseball cap will blow off, if not your hair as well. The seatbelts are massive lapbelts with a hook closure system but except for the rollbar behind the driver the safety elements end there. No traction control. No ABS. No airbags. No steel beams in the doors. And sitting as you do there is a feeling of exceptional vulnerability as you eye the other traffic. I noticed that whenever there was a vehicle that could offer some risk to us, such as one waiting at a stoplight, Brian's finger was never far from the horn button, which is found on the dash. That said, the horn sound is pretty wimpy for a car that makes your chest hair grow merely by sitting in it. It was an absolutely gorgeous hot and sunny day so after fuelling up and brief test circle that Brian likes to do before each drive we headed west out of Ottawa in our accompanying circle of impressive noise. Our first stop for the day was the town of Almonte, 45 minutes away. There are a lot of small towns surrounding Ottawa that are just signs on the highway exits, so we were determined to discover a bit more of our own country. Almonte (the "e' is not pronounced) was founded around 1818 and known variously as Shepherd's Mills and then Shipman's Mills until around 1855, when it was renamed after a Mexican general, Juan Almonte, who participated in the Battle of the Alamo in 1836 and subsequently had an interesting and distinguished career. although his monarchist leanings ended up forcing him into exile in Europe, where he died in 1865. It appears that residents of this little town (population 5,000 today) on the banks of the Mississippi River (no, not the famous one) were enthused with anti-American sentiment when they decided to rename it for General Almonte. As sources note, this may be the only town in Ontario, or even Canada, named for a Mexican revolutionary soldier. The not famous Mississippi River was the source of the town's prosperity as it powered woolen mills from its inception, with eight of them in operation by 1850. Situated on a railway line between Brockville and Ottawa, it was a highly prosperous community But the last of the mills closed in the 1980s and since then the town has put its effort into attracting tourists. Many of its 18th Century buildings are still standing in the quaint downtown area, and a big effort has been made to memorialize two of the area's native sons: Dr. James Naismith, who invented basketball in Springfield, Massachusetts in 1891; and R. Tait McKenzie, a medical doctor, sculptor and promoter of physical fitness training. The athletic facility at York University in Toronto, where I studied law, is named after the latter. It was a quiet Sunday morning as we parked the Cobra and strolled along the main street, which has a good share of little restaurants and specialty shops. Brian's comments that whenever he drives the Cobra it is "like the circus comes to town" was true as people stopped to talk about the car. Before departing, I popped into the tourism office in the Town Hall, where the young ladies were only too happy to give me brochures for the area and encourage more visitors. And they map they gave me showed the way to our next destination. 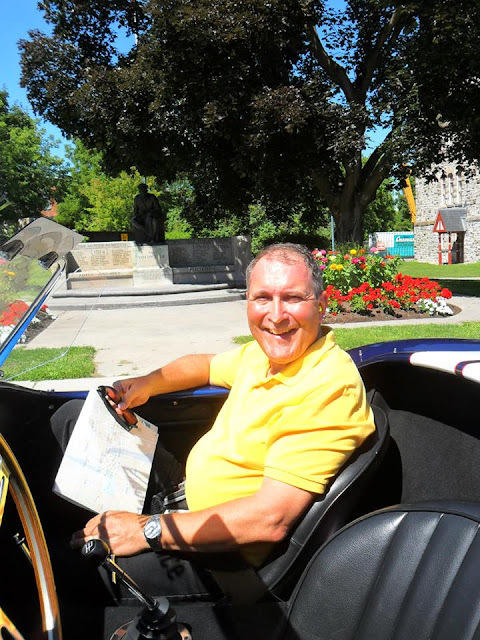 Carleton Place was known to me only as an exit from Highway 7, which runs westward from Ottawa towards Peterborough and beyond, and I had only stopped from to time on the gas station and fast food strip that runs along the highway. I knew it to be the hometown of Captain Roy Brown, who was credited with shooting down Germany's Red Baron, fighter ace Manfred von Richthofen, in aerial combat in 1918. Following Highway 15 southwards, we enjoyed the fine country scenery and then came to Carleton Place, crossing the Mississippi River and seeing lots of summery boating activity to the right of the bridge. A larger town (population 9,400), it also boasts some very fine stone and brick buildings along Bridge Street. There is a small tourism office in a renovated log cabin, which also contains a small museum devoted to Captain Brown, who is also immortalized on a big mural on one of the town's walls. I invited Brian for lunch at the pub located on the banks of the Mississippi and we enjoyed some good food while watching the jet ski drivers having fun. Then it was back into the Cobra as we headed to Smith's Falls and then on to Merrickville for a coffee. We returned to Ottawa along the Rideau River, which boasts a great number of ostentatious houses along the shore. And so ended my wonderful Cobra experience. It really is like having the circus come to town. The noise, the power, the connectedness with the car are unique, more like flying in an open cockpit airplane rather than driving. I noticed that when Brian put the hammer down (which we could not do very often), you could feel the car want to swing out. Not something for inexperienced drivers and probably not my choice now for a cross-country trip compared to the extremely civilized Corvette of mine but it was certainly motoring for heroes. With sunscreen. 100% fun!